One of the best things we can do to grow as musicians is to play with other people: Leave the lonely study aside and harmonize with other musicians. This is even more important in instruments such as the violin, which have very limited polyphony, and we often feel like we are missing something if we do not have another musician to play with. The truth is is that finding people with the appropriate skills to play with us, people that have similar musical interests and want to practice with us can often be frustrating. Not to mention how difficult it can be to arrange the meetings, find a place to practice, etc.. That's why we often look for methods so we do not end up feeling so lonely. It is common practice to play along the recordings by the consolidated artists, and although this is a great idea it can end up not being very satisfactory, as in reality playing while listening to another solo can end up being more annoying than pleasant. That is why recordings of popular works without the solo instrument were invented, so we could play with a pianist, chamber or orchestra whenever we wanted. The “Minus One” recording labels became very popular for that reason, I have a few scores with their corresponding Minus One CDs to play along. But for a few months I have been following a new idea called “Practice Your Music” (www.practiceyourmusic.com) that has really caught my attention. It is a web application that offers a lot of advantages over the Minus One concept, a web page where you can choose a piece from the many available styles and instruments so you can have an ensemble to play with you. What does “Practice Your Music” offer? 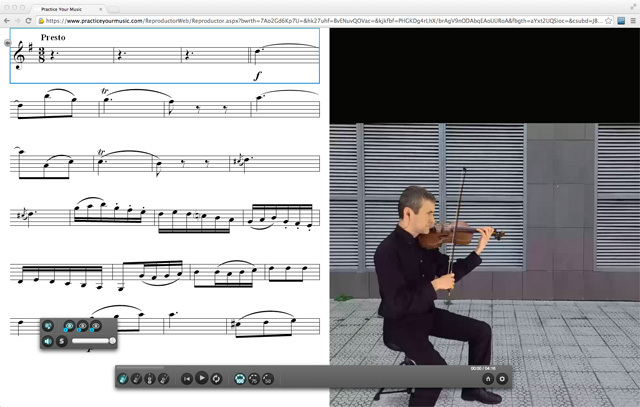 With “Practice Your Music” we can have the desired accompaniment at any, all we need is a computer and a standard web browser. Moreover, we can choose which instrument we want to replace in the ensemble as we see and hear them playing, eg in a string quartet we could became first or second violin, or even mute several musicians to listen to the one that suits us. Each instrument has a difficulty level indicator, so we know if it is suitable for us. We can vary the tempo of the tune between normal, slow and very slow, so it is easier when we first encounter the piece. We may also follow the corresponding score of the chosen work on the screen. We can see the performers playing or singing the different pieces and how they do it. 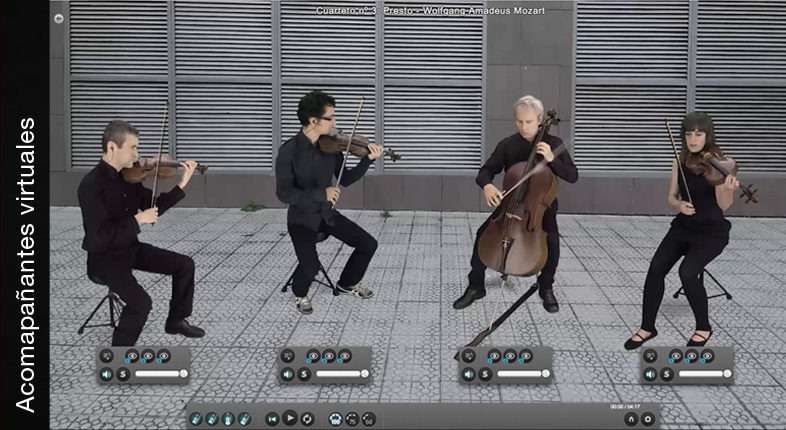 Noteworthy is the fact that you can choose from several views of the musicians, so for example in the case of the violin, you can select an overhead view of the musician so we can see fingerings, positions and technique they are using for the performance. 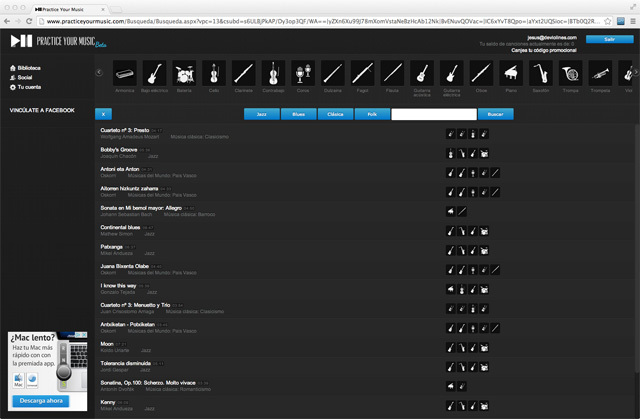 There are 4 musical styles available: classical, jazz, blues and word music. Although the violin as an instrument only appears in classical and folk songs, we can actually use many of the jazz and blues tunes and replace the vocals, the saxophone or any other instrument with the same musical range as the violin. It would be best to have a good speakers or decent stereo system connected to the computer, since the integrated audio systems in most computers are usually not very good quality. And that is it. I worth saying that the service is still presented as "Beta", but from what I could try for several days, it works fine with no bugs, so it seems like a pretty definitive version. 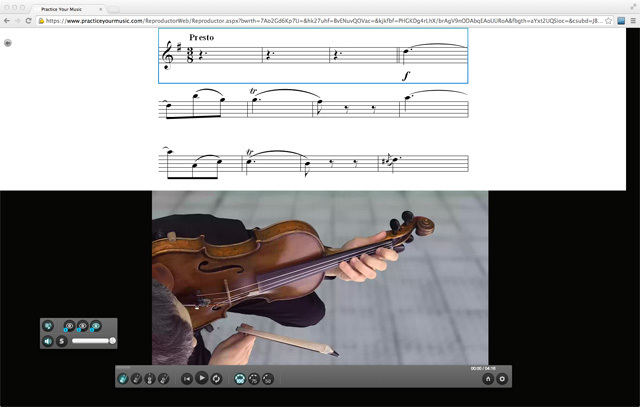 I would only add a few more options related to the scores: when we are reading, the score jumps from page to page right on the note being played, which gives you no time to prepare and look at the next bar, which is what is usually done reading music. It would also be nice to be able to download pdfs of the music sheets to print them, so you can read them in paper at a glance.